Flexography is the printing method that belongs to the Letterpress techniques. This implies that the printing areas rise above the non-printing areas. This printing method is dated back to the end of 19th century. However, it must be pointed out that the former method was just an early predecessor of the present method and thus these methods resemble each other only roughly. That time it was so called Flexography method. When ink is transferred from the fountain roller to the metering roller it is trapped in the cells from where it is transferred to the plate cylinder that is wrapped with a flexible printing plate. This flexible printing plate is typical for such a printing technique. The printing plate is nowadays manufactured from photopolymer or rubber. Formerly only rubber was used for this purpose. The printing plate is attached to the plate cylinder with a double-sided adhesive foil or sleeves. The last of the set is an impression cylinder that creates a necessary pressure to print the pattern to the printed material placed between plated and impression rollers. Flexography recently experienced a significant quality improvement and it strengthened its position among the other printing techniques. The main reason was especially an undisputed advantage of using a wide choice of possible substrates. It is not only paper, but also various plastics, foils, and plastic covers. It is possible to print even on rough surfaces. This is an enormous advantage of this method at this age of plastic covers and bags. Flexography has a choice of advantages, but it has also some disadvantages. The most obvious is a possible distortion of the pattern due to a soft plate material. Nowadays these problems are eliminated by various ways but the fact is that they may occur. As mentioned above, one of the reasons of increasing popularity of the flexography and the reason why it is being sought after is its versatility. 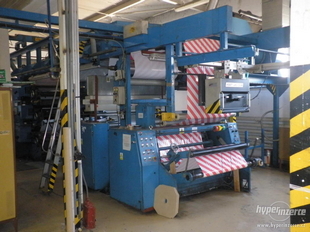 Thus the flexography printing machines must be adapted to these characteristics. Basically there are two configurations of these machines. First is the linear configuration where the components are arranged inline. Similar configuration is used e.g. 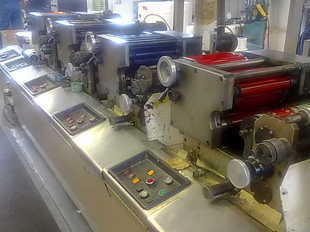 in the offset printing machines. The second is with the components arranged around the central plate cylinder. More common is the first configuration with the components arranged inline. 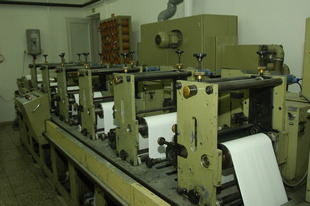 The machines are mostly arranged in the version for printing "from reel to reel". There is a reel of the material to be printed. It passes the printing machine and the printing process and it is wound back to the reel at the opposite side. The machine can be found also in the arrangement with a knife at the output when the printed material (substrate) is cut directly into individual sheets or parts. Flexography printing machines are interesting since it is possible to add units with different technologies to their systems. For example, it is possible to combine the flexography method with rotogravure and use this method to apply special security features. Or it can be combined with the silkscreen that can be used at places where a thick ink layer or frosted paint should be applied. Special parts of flexography printing machines are delamination and relamination units. These components are used when printing on self-adhesive materials. During the printing process, the self-adhesive material is separated from the silicon support and the material may be printed directly on the adhesive layer. Then both parts are stuck together again. This technique is used in the applications where the print is required on the inner side of the label, i.e. on the adhesive layer.